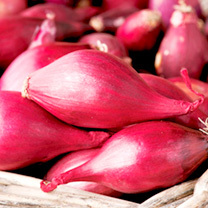 A flavoursome maincrop, thin necked semi-globe to globe shaped, deep red onion. Very good for over-winter storage. RHS Award of Garden Merit winner. Maturing time approximately 24 weeks from sowing. This variety trialled, tested and recommended by the National Institute of Agricultural Botany. Dig and manure the soil in autumn or early winter. Give the ground a light dressing of lime early in February and a week before sowings. For use from September onwards sow seed March-April in drills 23cm (9") apart. Thin the plants out finally to 10-15cm (4-6") apart. For exhibition onions, sow under glass December-January, transplant the seedlings into boxes or pots and gradually harden off for planting out in April. Row 6m (20').